This can be defined as the rate charged by banks to their most credit worthy customers for loans. The term on its own is generic but in the States, it primarily refers to the Wall Street Journal Prime Rate. 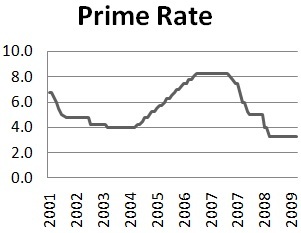 As reported by the Federal Reserve, this is usually posted by a majority of the largest banks and is usually 3% higher than the Federal Funds rates (this is determined by the Federal Reserve), so when the Fed drops its rate, you can expect the Prime Rate (in most cases) to fall as well. Depending on economic conditions, this index can be volatile or not move for months at a time. If you've got a credit card, then keeping tabs on this rate is highly recommended as it is associated with all types of consumer debt. This figure is normally printed by the Wall street journal once a month.